Music that rocks. Music that revitalizes. Music that fills your NEEDTOBREATH. Yes, it's a name that you say in one breath. 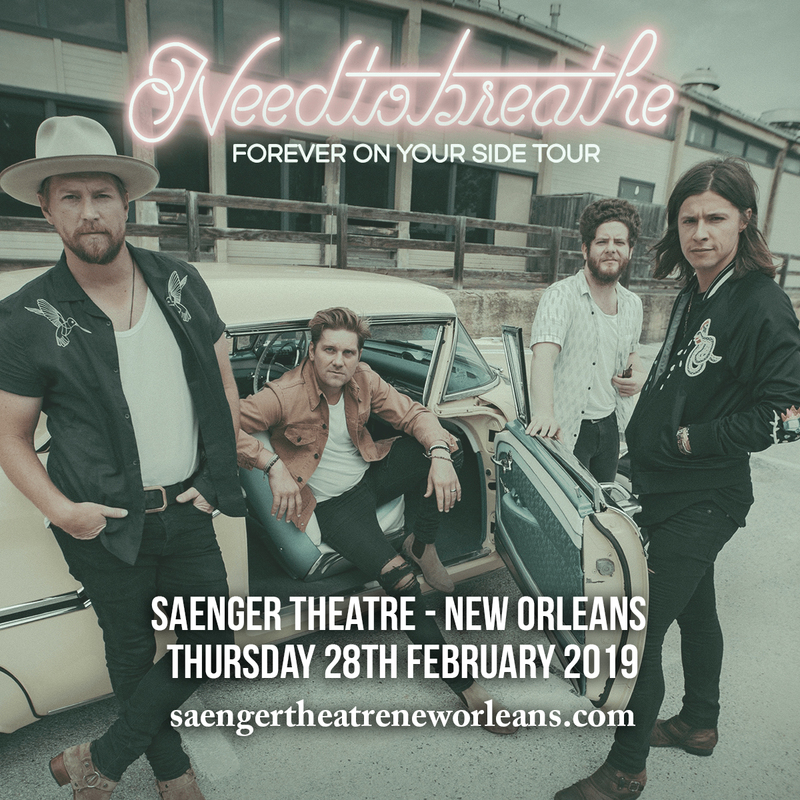 Needtobreath will fill the air with inspiration and rock the halls of the Saenger Theatre – New Orleans with their pulse-pounding rock sound. Save the date: Thursday 28th February 2019. Clear your calendar and take time to be amazed. Tickets are now available, so catch a breath and get your tickets now before this opportunity blows out the window. Needtobreathe is often categorized as a Christian rock band. But the band themselves are quick to dismiss such 'labels'. Instead, they affirm that their music appeals and is available for everyone. Needtobreathe may openly declare their faith which also shines through in their music, but it comes across as honest, inspiring, revitalizing, and most of all, charged with the intensity of pure rock music. Current band members include Bear Rinehart (lead vocals, guitar, piano), Bo Rinehart (backing vocals, guitar), Seth Bolt (backing vocals, bass) and Josh Lovelace (backing vocals, keys). Since their signing to a major label in 2006, the band has released six studio albums to date, namely,: Daylight (2006), The Heat (2007), The Outsiders (2009), The Reckoning (2011), Rivers in the Wasteland (2014), and Hard Love (2016). Needtobreathe has a decent amount of following that will not miss their shows in a heartbeat. Join in! This is one show that you needtoexperience!